The Turtles make short work of the Shredder’s robots and various booby-traps, eventually confronting chromedome-himself. Playing the standard “villain seduction” routine, the Shredder offers the Turtles a place within the Foot. The Turtles promptly refuse, leaving the Shredder to unleash his newest mutant henchmen, Bebop and Rocksteady, who promptly knock each other unconscious. The Turtles rescue Splinter and carry him to the surface, where they are confronted by a very infuriated Bebop and Rocksteady. After a short battle, the Turtles manage to trap them in a cage in Central Park Zoo, as April gets the whole thing on camera. 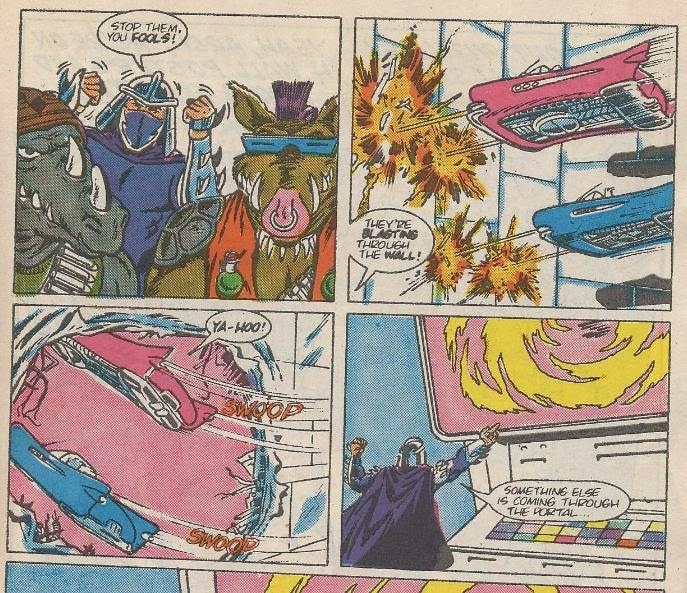 The Shredder’s robots eventually come and break Bebop and Rocksteady out of their cage, though they aren’t too excited about reporting their failure back to the boss. Later, back at the Turtles’ Lair, April nurses Splinter back to health and the TMNT leave to track down the Technodrome once more. At an abandoned mansion somewhere downtown (because you know there are a ton of those Scooby-Doo-esque haunted houses in the middle of Manhattan), Shredder learns of the inventor Baxter Stockman and his Mousers: toothy machines that like to chomp rodents. Shredder confronts the downtrodden scientist and offers to produce his Mousers on a vast scale. Baxter gets busy building a computer to control the Mousers and Shredder manufactures an army of them within the Technodrome. 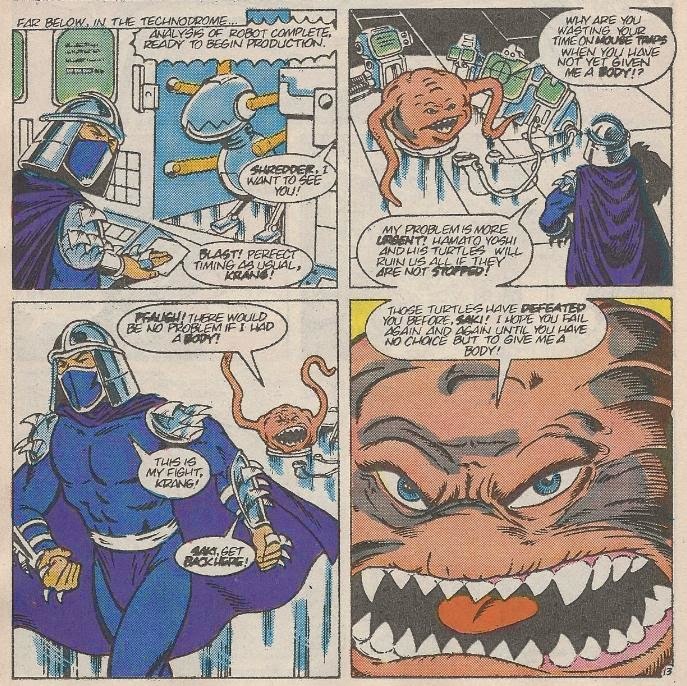 Krang is less than pleased that Shredder is still obsessing over his revenge against Splinter instead of building him a body, and begins scheming. Back at the lair, a rested Splinter hobbles to his feet, as April leaves to go back to her apartment for a bit. As soon as she leaves, the Mousers invade the lair and attack Splinter. Splinter is aided by the TMNT, who return from their search after reaching a dead end. Investigating the wrecked Mousers, they find Baxter Stockman’s logo imprinted on the foot of one of them. They decide to ask for April’s help in tracking down Baxter Stockman and after a little computer sleuthing, she gives them the mad scientist’s address. Back at the mansion, Baxter decides to turn in for the night and return home. Shredder thinks he knows too much and sends a unit of Foot Soldiers to kill him. The TMNT intercept him at his doorstep and save him from certain death. 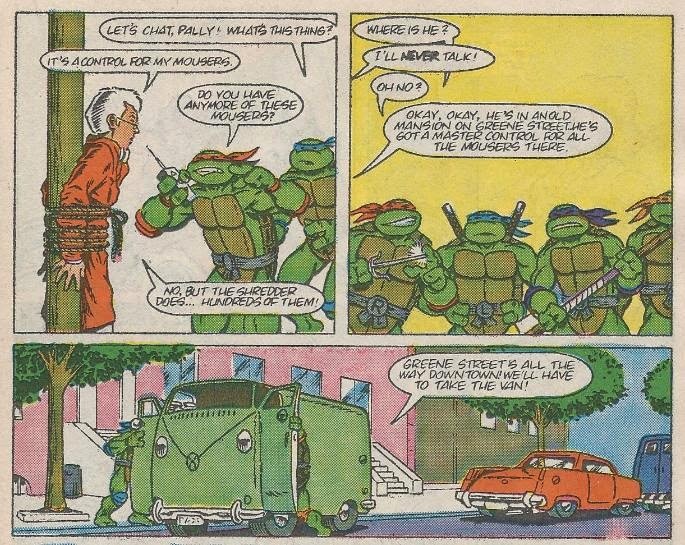 After tying him up for the police, they learn the Shredder’s whereabouts and head to the old mansion in Baxter’s van (which they so wholesomely “appropriate”). They decides to stop by April’s place first, which was a good idea, since they arrive just in time to save them from a horde of Mousers. Leaving April’s completely demolished apartment and heading for the mansion, they elect to send Mike in first. Mike is captured by the Shredder, but quickly set free by Krang (who hopes that a few more defeats will leave the Shredder with no choice but to build him a body). Mike tricks Shredder into destroying the computer controlling the Mousers, but as the mansion collapses around them, Shredder escapes to the Technodrome. After rescuing Mike from the rubble, the TMNT drive off in their new van. The TMNT return to Baxter’s apartment and shove his van up to his lab. Don gets busy rebuilding the van into something more battle-friendly. Back at the Technodrome, Krang presents Shredder with plans for his new body. Shredder chooses to ignore them once again, instead opting to open the newly completed transdimensional portal in search of newer weaponry from Dimension X (Krang’s place of origin). Back at Baxter’s lab, Don puts the finishing touches on the new Turtle Van and the Turtles take to the streets. Meanwhile, Shredder opens the transdimensional portal, allowing a trio of hot rodding teenagers from Dimension X (in an actual flying hot rod called a "Starmobile"), the Neutrinos, to enter our dimension by mistake. As the Neutrinos blast their way out of the Technodrome, they are quickly pursued by another denizen of Dimension X: General Traag, leader of Krang’s Stone Warriors! *The credits to this issue mistakenly misspell David Wise’s last name as “Weiss”. 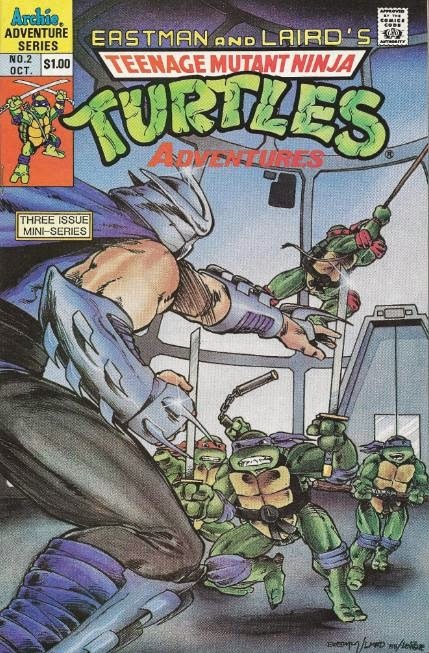 *Chapter Two of this story adapts the second half of the episode “Enter the Shredder” of the Fred Wolf TMNT cartoon. *Chapter Three of this story adapts the episode “A Thing About Rats” of the Fred Wolf TMNT cartoon. *Chapter Four of this story adapts the first half of the episode “Hot Rodding Teenagers from Dimension X” of the Fred Wolf TMNT cartoon. *Raph can be seen reading an issue of “Gizmo”, a comic by Michael Dooney. *This issue was reprinted in the UK by Fleetway as TMHT Adventures #2. Cartoon adaptation. Bah. Eastman’s and Laird’s cover is quite nice, though, and my favorite of their covers for the miniseries. As for the story (or stories, rather), we get bits and pieces of three episodes in this one issue. Bebop and Rocksteady don’t make the grandest entrance at first, but that’s kind of the point since they’re supposed to be imbeciles. Still, I love how violent they were in these early stories and Michael Dooney’s art captures their ferocity nicely. Baxter is played up more sympathetically than in the cartoon (he doesn’t try to keep Shredder’s whereabouts a secret after the Turtles save him), though don’t get too comfortable with him. After the episode adaptations are done away with early in the ongoing series, Baxter will scarcely be seen ever again. Also, hey! It’s the Neutrinos! I hate those guys.